A graduating fashion student’s senior fashion show is not dissimilar from that of a professional designer’s. Both parties spend months (or years) storyboarding the collection, sourcing the perfect materials and physically constructing the garments, often entirely by hand. Both put their mind, body and soul into their craft — but in the case of a fashion student, they’re tasked with doing it on the fly, with only a few semesters of experience and as many resources as their respective universities provide them. But more and more, these senior runway shows are inseparable from those of an industry darling, with much credit attributed to the programs from which they’re graduating. 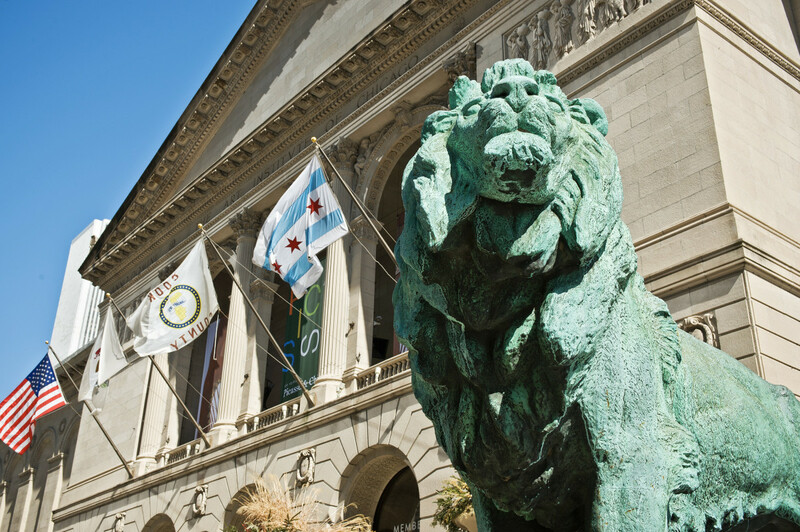 The School of the Art Institute of Chicago (SAIC), which is associated with the museum of the same name, is one such university. Established in 1866, SAIC came decades before the majority of its contemporaries, including Pratt Institute (1887), Parsons School of Design (1936) and Fashion Institute of Technology (1944). With undergraduate and graduate degrees available in such fields as Art History, Writing and Studio (and concentrations in the likes of Fiber and Material Studies, Sound and, relevant to our interests, Fashion Design), SAIC has been named “the most influential art school in the U.S.” by Columbia University’s National Arts Journalism survey. SAIC counts Halston, Georgia O’Keefe and Jeff Koons (as well as Kanye West, who received an honorary diploma in 2015) as alumni, which is, obviously, impressive. While there’s no question that Chicago is a global artistic capital, its presence within the fashion industry is intimate, but steadily growing. Virgil Abloh, who was raised 90 miles west of Chicago in Rockford, Ill., is one such Windy City stalwart; he received his Master’s in Architecture at the Illinois Institute of Technology in 2006, and will be getting a retrospective — tentatively titled “Virgil Abloh: Not New, Now” — at Chicago’s Museum of Contemporary Art in Chicago next year. That’s not to say that Chicago is exempt from the fashion community, because it’s not. Its retail, design and educational talents are impressive, and while it may be no New York (or, these days, Los Angeles) that doesn’t mean it’s not an industry contender. Much of SAIC’s leading advantage, actually, is because of just that — it’s located 800 miles from New York — or so said the graduating seniors I spoke to four days after their final runway showcase and exhibition on Friday, May 4. Beniaris, like many concentrated art students, always knew that she wanted to go to fashion school. (“I have these like really intense memories of me as a kid sketching and getting in trouble in my second grade class, because I wasn’t paying attention, because I was drawing sketches,” she said.) After working on the costumes for her high school’s theater productions, she looked at a number of New York-based programs before choosing SAIC. The prospect of leaving home was exciting, but Beniaris was more excited, she recalled, by how interdisciplinary the curriculum was. Beniaris counts Thom Browne as one of her primary influences, and, accordingly, places an enormous emphasis on tailoring in her own designs. She interned with Browne last summer, traveling with him and his brand to Paris for his enchanting Spring 2018 show. But as a womenswear designer first and foremost herself, Beniaris looks to a stable of female figures, too, including Rei Kawakubo, Mary Katrantzou and others who play with unexpected fabrics to create sculptural, experimental designs. 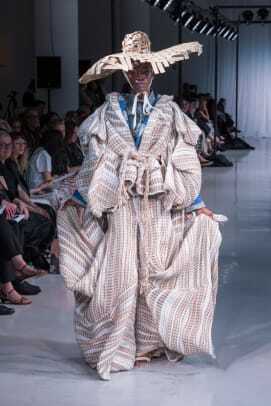 Like Kawakubo’s, Beniaris’s creations are oversize, and quite proportionally unique from what you may expect to see on a ready-to-wear runway; one look in particular piled on burlap fringe, quilted linen and handwoven cotton piles to create a voluminous, fluffy gown with explosions of pattern and texture. It was also during this summer in the Netherlands that Goble, along with the rest of her classmates, began brainstorming her final collection, the public showcase of which has become an annual SAIC tradition for more than 84 years. “At the end of our junior year, our teachers tell us, ‘This summer, start your research,'” said Beniaris. “‘Start reading and writing and drawing, and not even making clothes, but figuring out what you’re interested in and what you want the collection to be about. '” Then, when students return to campus, they hit the ground running, first spending their fall semester taking a number of workshops, including in womenswear, tailoring and draping. This is unlike several other fashion schools in which students devote their entire final year to their collection. Finally, come the New Year, students begin production, and everything — from the sewing to the patterning to the weaving — is done in-house. Friends, thankfully, help out. “It becomes a really collaborative effort, because you have that short amount of time,” said Beniaris. “I started treating it like a business and finding people with talents I didn’t have, or talents I didn’t have time to pursue.” That element of resourcefulness becomes a huge benefit of the Chicago education. “I feel lucky that I chose a school in Chicago, whereas in New York, students have all the resources, whereas here, I think you have to be a little bit more creative in finding materials.” One of Goble’s materials was a hand-me-down Ikea rug, which her uncle, an interior designer, gave her to transform into a jacket. “I mean, New York has an incredible garment district where you can find anything and everything at the tips of your fingers, but to create something amazing, you have to create it yourself from start to finish,” said Beniaris. Chicago, in fact, already has a leg up: With an art scene as established as it is, Chicago’s fashion and design fields begin to blur together, tearing down any walls that may have existed between them in the first place. Chicago’s role in the fashion industry, suggested Beniaris, is to continue to push it in new directions. New York may, eventually, take more notice, but Chicago will be just fine if it doesn’t. This summer, many of SAIC’s graduating seniors — Beniaris and Goble, included — will pack up and move from Illinois to begin their careers. SAIC encourages its fashion design students to work in-house at a brand before striking out on their own. When I ask Goble if she’d ever relocate to Paris should an opportunity at the Galliano-led Maison Margiela arise, she was game. “Oh, I would move anywhere,” she said. “My collection, too, is about traveling and wanderlust and wanting to go wherever.” Learning French, she said, would be a plus.